If you have never cruised on a European river before, then you are missing something spectacularly unforgettable. For the hopeless romantics, adventurous souls, and the historical fanatics, there truly is something for every traveler. Whether you want to go to Europe or you’re just thinking about cruising in general, the following are great reasons why you should take a European river cruise. A Lot of Country in a Short Period: If you want to see Europe, but don’t have a lot of time, this is the perfect opportunity. You get a sample platter of some of the most iconic sites in the world and sometimes a taste of up to 10 different countries! More Time: Less time cruising from port to port means more time in the city during prime daylight hours. Plus, you only have to unpack once! Cruising along the coast gives you quick access, providing you with quality time exploring great cities. Comfort: Not only is comfort and relaxation an important part of the cruising life, you can safely be at ease knowing that the coastline is just a hop, skip, and a jump away. So, for those who have a tendency to become seasick or have fears of being out in a big ocean, let me alleviate your worries now and tell you that you don’t have to fret about these things on a river cruise. 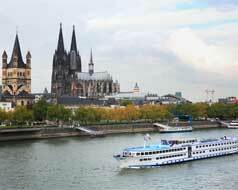 Included Tours: When it comes to river cruises, your tours or shore excursions are already included in your cruise fare! These tours help you make the most of the cities you are discovering. Picturesque Scenery: There are no other words to describe your passing scenery than absolute bliss. It is picturesque perfection. Enjoy the rolling landscape, fairytale castles, and sunsets on the horizon over the pristine rivers. Value: A European river cruise is worth every penny and more for what you get in return. Hospitable onboard service, intimate cruise atmosphere, escorted tours, and more! Social Benefits: You have the opportunity to get to know your fellow cruise passengers in an intimate setting. Meet and make friends from all over the world.